I’m not sure if freshman Rep. Alexandria Ocasio-Cortez (AOC) was around during the Reagan era and the economic notion of supply-side economics, but I’m pretty sure her partner in crime against capitalism, Elizabeth Warren was. I don’t know what either of these women studied in school, but I can assure you it was not economics. Who is Elizabeth Warren to tell us the difference between rich and poor? One’s bank account is not the only measure of wealth, for what is wealth if you are poor in spirit. What should I care about taxes when I do not have my health? Am I rich if I if have no family or relationships, or am ostracized for my political beliefs? I would argue not. 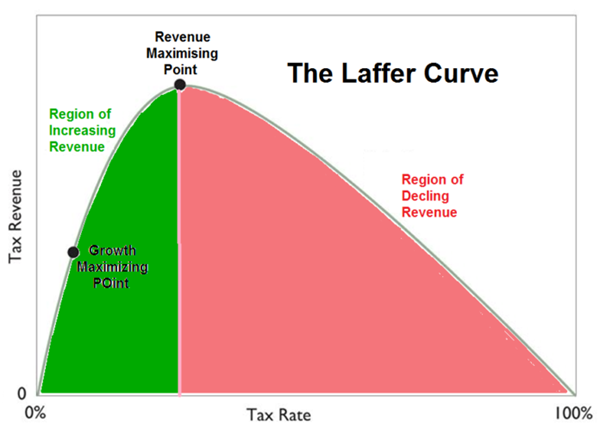 The Marxist school of social economics was introduced to the concept of the Laffer curve in the 80’s. Economist Arthur Laffer attempted to show the relationship between tax rates and the amount of tax revenue collected by governments. It illustrates the concept of taxable income elasticity, for example, taxable income changes in response to changes in the rate of taxation. In layman’s terms, you can only tax a person to such a point that they will continue to work. Take a look at the graph. The concept of raising taxes is antithetical to growth as one can see. As you continue to raise the tax rate on individuals and/or corporations, you will actually decrease the overall amount of revenue brought in by the government. This ultimately leads to the type of economy that the radical left desires. One in which incentive has been removed and to slow down entrepreneurism, which fuels capitalism. This will of course does not affect the non-tax paying proletariat, who already lounge in the austerity of socialism. Freshman Democratic Rep. Ilhan Omar has floated taxing the wealthy at a rate of up to 90 percent to fund the free-for-all programs. That’s a great idea. I think she should implement it first thing tomorrow in Minnesota. No term limits will be needed for her. Remember that the mantra is always tax and spend. It has raised its ugly head again in the form of those mentioned above. Don’t be lulled into thinking that they will stop with just the ultra-rich. This will be just the start. You will be next. While many Democrats have previously backed higher taxes for the wealthiest Americans, they’ve rarely made the issue such an early focal point of their campaigns. Perhaps the last time this was brought to the public’s attention in an election was Democratic nominee Walter Mondale in 1984, when he pledged to raise voters’ taxes. What a surprise, he lost to President Reagan in a historic landslide. Caveat emptor. It is not a trade war … yet.